Wondering how long Adderall stays in your system? Well, I’ve put together the following information and outlined different types of testing to help you with your thoughts and help decrease your anxiety….or maybe this will increase it?...idk. Hope you’re not getting blood tested at work, because your adderall consumption will definitely be returned “positive” on that one. Things you should know -- Adderall is a lipophilic drug, meaning it distributes itself into fat stores and slowly seeps out over time. The half-life is roughly 10-14 hours for l-amphetamine and d-amphetamine. Extended release (Adderall XR) doesn’t only extend its laser focus studying effects, it also extends its shelf life in your system. 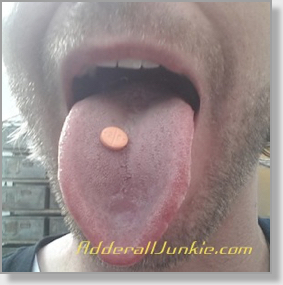 Immediate release Adderall (Adderall IR), gets processed in your system faster (around 3-4 days). Also, adderall stays in your body depending on many factors, such as, how big you are, male or female, mode of consumption (i.e eaten, snorted, injected), diet, frequency of consumption, and metabolism. So for all you pof heads out there, the more adderall you take daily, the longer it will stay in your system. This is true for marijuana as well. Amphetamines are typically detectable in the urine anywhere from 1-3 days. This depends on the amount that you consumed, and if you have consumed Adderall previous days. Flushing the system can help speed up the process. When a hair test is conducted, it usually pulls about 1.5 inches of “growth” on the individual for testing purposes. The growth part, is the part of the hair from the base of the scalp measure 1.5” in length. The detection period can last up to 90 days. The shorter your hair is, the better chance you have of a negative test. Guys, we have the advantage here with our shorter hair. It’s rumored that saliva testing can detect amphetamines for up to 3 days. We don’t know a lot of information about saliva testing, but we’ll update once we learn more. If you like to have your adderall dissolve under your tongue rather than swallowing it, lets hope this test doesn’t get more common. Blood testing is the most precise test in finding out how long Adderall has been in your system. It can detect Adderall up to 12 hours. It also distinguishes the difference between dextro-amphetamines from levo-amphetamines, which determines if the person is taking a mixture of amphetamine salts, like Adderall, or if the person is taking a single-salt dextro-amphetamine, like Vyvanse. Blood testing also is able to distinguish the difference between therapeutic/normal/prescribed Adderall consumption and Adderall abuse. That’s why employers will typically blood test if they are concerned about amphetamine abuse. Because of its precision and the equipment involved in a blood test, blood testing for Adderall is the most expensive. So how long does adderall stay in your body? It really depends a lot on the person, their habits and the type of test taken.